Chelsea Knight and Mark Tribe, Posse Comitatus. Performance at the Palais de Tokyo, Paris, 2013. Image courtesy of the artists. DiverseWorks is pleased to present the final iteration of New York-based artists Chelsea Knight and Mark Tribe’s Posse Comitatus—a three-year collaborative project that examines the sociocultural dynamics of paramilitary groups and the representation of their political ideologies through performative gestures and movement. The title refers to a loose network of citizen militias whose actions and ideologies are influenced by the post-Reconstruction Posse Comitatus Act that limited the domestic use of federal military forces and who espouse survivalist methods as a means to defend individual liberty. In 2012, Knight and Tribe made contact with an upstate New York militia group and were allowed to record their activities, from the mundane interactions of everyday life to live fire field training exercises. This footage became the source material for their extended multi-disciplinary exploration of structures of power, politics, and government. Knight and Tribe worked with Cecil Slaughter, a choreographer in St. Louis, to create a dance performance based on the militia footage. Two versions of that performance were filmed and photographed: one on stage at Washington University, and one in a forest. Finally, in 2013, the artists worked with Austrian choreographer Valerie Oberleithner and two dancers, Lautaro Prado and Emilie Combet, to develop the project further focusing on rehearsal as performance activity. At the Palais de Tokyo, Paris, a series of public rehearsals were staged in front of video projections of the militia training exercises. As the militia groups continuously practice for an undetermined, hypothetical confrontation, the dancers rehearsed without ever finishing or finalizing a dance piece. 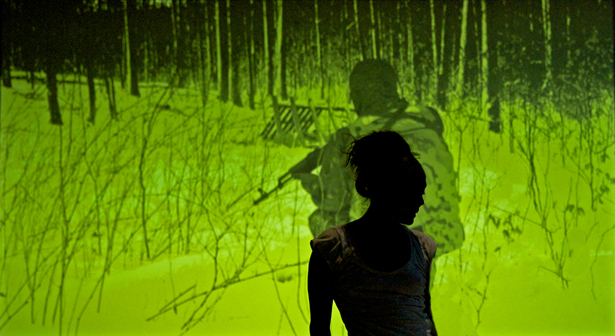 Posse Comitatus‘s culminating presentation at DiverseWorks includes a single-channel video projection integrating the original militia footage with the performance footage from St. Louis and Paris, along with an exhibition of photographs. A series of public programs will speak to issues of power, protection, and preparedness—concepts that have particular resonance in Texas and American society at large given the current (often contentious) debates around issues of privacy, surveillance, gun control, and the border. In their individual artistic practices, Knight and Tribe share an interest in examining the formation of specific cultural or societal groups, as well as their internal dynamics of power and the external forces that shape them. In addition to Posse Comitatus, DiverseWorks is presenting individual works by each artist. Tribe’s Chinoise A is a remake of a scene from Jean-Luc Godard’s La Chinoise (1967) in which a radical student contemplates bombing a university. The original scene, which takes place on a train, is re-imagined as an online video chat. The script, which is based on a transcription of the Godard film’s English subtitles, is relocated from Paris to New York and updated from 1967 to 2004. For Don’t Tread on Me, Knight collaborated with participants including Tea Party members, Ayn Rand enthusiasts, Libertarians, ex-communists, artists, and stockbrokers with one thing in common: they are all in favor of free-market capitalism. Through a series of interviews, encounters, Greek-style choruses and other choreographed ensemble elements, both fiction and documentary, the work explores the way politics are formed and articulated. Chelsea Knight received her BA from Oberlin College and her MFA from the School of the Art Institute of Chicago. Knight recently completed residencies at the Whitney Independent Study Program, the Skowhegan School of Painting and Sculpture, and the Lower Manhattan Cultural Council Workspace program. She has had solo exhibitions and performances at the Brooklyn Museum; The St. Louis Art Museum; Abrons Art Center, New York; Momenta Art, Brooklyn; Night Gallery, Los Angeles, and has exhibited her work in group shows including Nouvelles Vagues, the Palais de Tokyo, Paris; Anti-Establishment, Hessel Museum of Art CCS Bard, NY; the Young Artists’ Biennial, Bucharest and the Istanbul Biennial. Mark Tribe’s photographs, installations and performances explore the intersection of media and politics. His work is exhibited widely, including solo projects at the Corcoran Gallery of Art, Washington, DC; Momenta Art, New York; the San Diego Museum of Art; G-MK, Zagreb; and Los Angeles Contemporary Exhibitions. Tribe is the author of two books: The Port Huron Project: Reenactments of New Left Protest Speeches (Charta, 2010) and New Media Art (Taschen, 2006). In 1996, Tribe founded Rhizome, an organization that supports the creation, presentation, preservation, and critique of emerging artistic practices that engage technology. He is Chair of the MFA Fine Arts Department at School of Visual Arts, New York. DiverseWorks is a non-profit art center in Houston, Texas, dedicated to commissioning and presenting new visual, performing, and literary art. DiverseWorks values the artistic process and encourages artists to test new ideas in the public arena. By investigating the social, cultural, and artistic issues of our time, DiverseWorks builds, educates, and sustains audiences for contemporary art. This project is supported in part by grants from the National Endowment for the Arts, Texas Commission on the Arts, and the City of Houston through the Houston Arts Alliance.